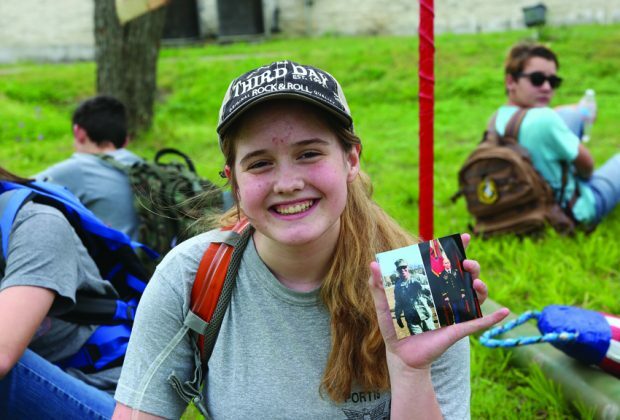 Micah Burton, who participates in a rucking class for Caldwell County homeschoolers, holds up a photo of her uncle, Stoney Portis, who fought in the Battle of Kamdesh. 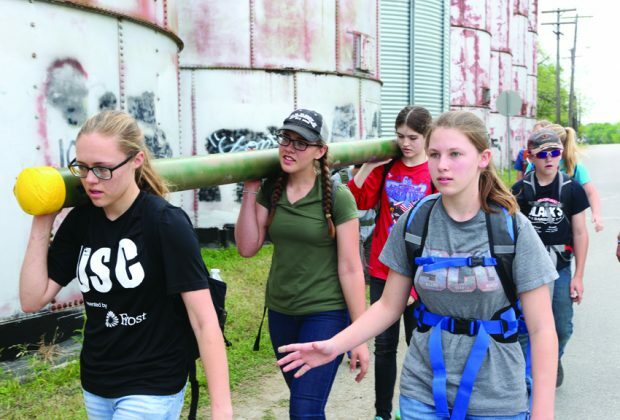 Strapping on heavy backpacks, Lockhart-area homeschoolers took off on a hike on Friday to learn about an even heavier story of courage and valor on a bloody battlefield in Afghanistan. 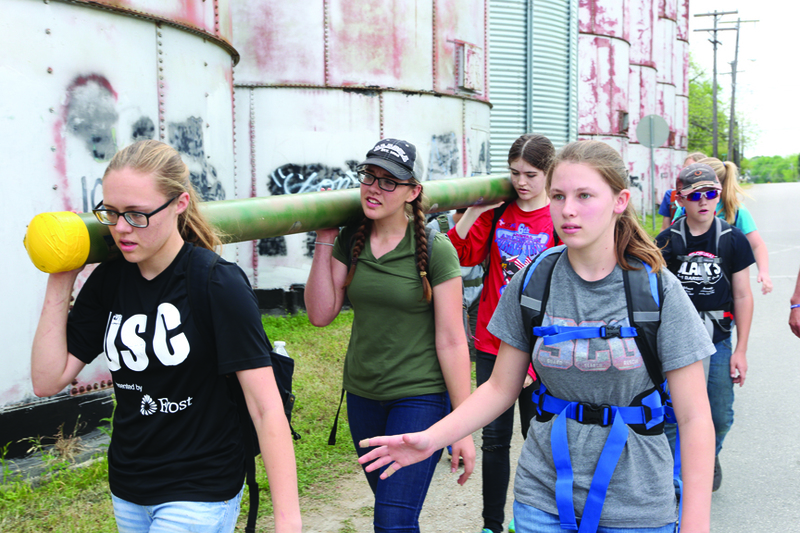 On a cloudy, humid morning, led by their instructor, Chad Jakel, a Travis County sheriff’s deputy who volunteers with the Christian Home Educators of Caldwell County, students marched through Lockhart as Jakel delivered a history lesson with a moral to its story. The Battle of Kamdesh took place in 2009 during the War in Afghanistan, a conflict that began in 2001 and continues to this day. The attack on U.S. forces at the American Combat Outpost Keating was the bloodiest battle for Americans since 2008, a battle that began when the outpost was invaded by Taliban forces and ended in eight American casualties, 27 Americans wounded and with more than 150 Taliban soldiers killed in action. The outpost was nearly destroyed in the ambush but is remembered nationally for the courage exhibited by the outnumbered Americans who fought valiantly, widely criticized for being a command failure, and celebrated locally for the actions of Captain Stoney Portis, a Lockhart High School graduate. Portis was at another base miles away when the attack broke out. He left the safety of that outpost to board a helicopter to join his troops, but his helicopter took fire and was forced to make an emergency landing and make a treacherous journey by foot to the battleground. 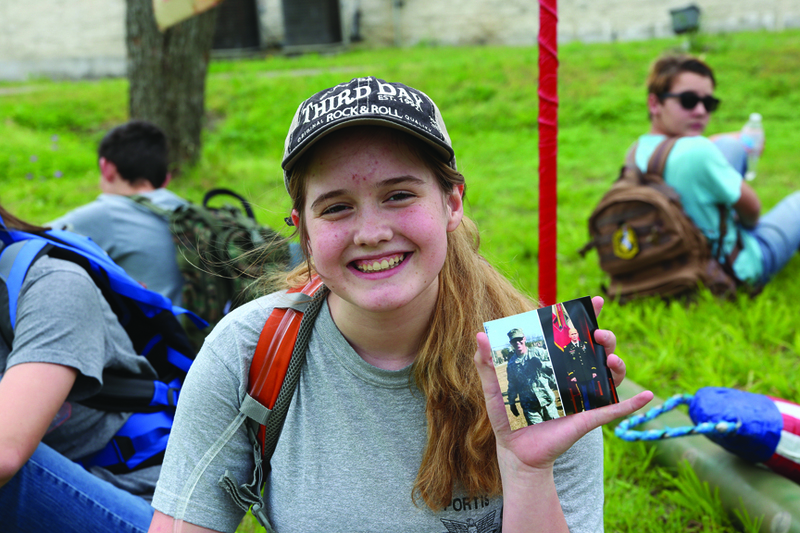 Students carried with them photos of Portis and the eight soldiers killed during the battle. 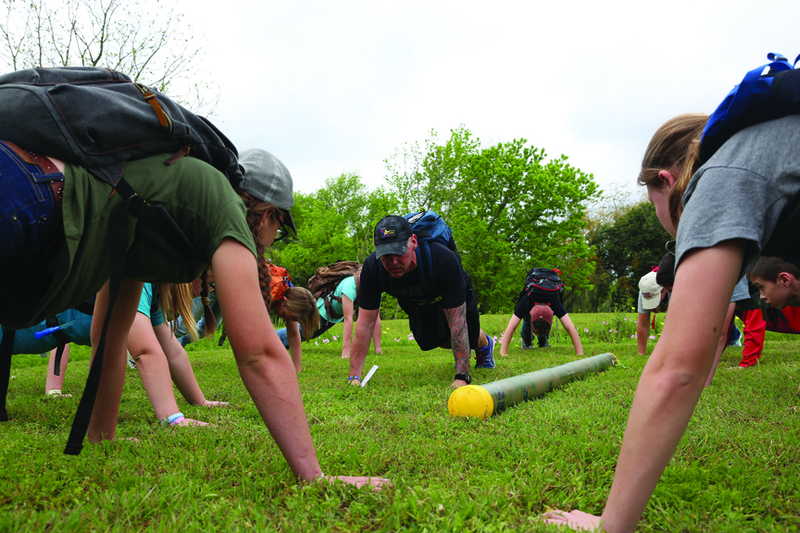 Between stops to do pushups and an exercise Jakel called “bodybuilders,” which resembled burpees, students shouted the phrase “Defeat is all around us, but defeat is not in us,” a chant to remind them never to give up in the face of adversity. Students did eight sets of bodybuilders on one of the stops to remember the eight U.S. soldiers killed in the attack: Justin T. Gallegos (Tucson, Arizona), Christopher Griffin (Kincheloe, Michigan), Kevin C. Thomson (Reno, Nevada), Michael P. Scusa (Villas, New Jersey), Vernon W. Martin (Savannah, Georgia), Stephan L. Mace (Lovettsville, Virginia), Joshua J. Kirk (South Portland, Maine), and Joshua M. Hardt (Applegate, California). “These men made the ultimate sacrifice,” Jakel said. Among the students participating on the march was Micah Burton, Portis’s niece, who shared with her classmates what it was like to be a small child with an uncle fighting a war overseas. Rucking, also called a loaded march, is carrying a heavy load while maintaining a relatively quick pace. It is a common training exercise in the U.S. military and also revered by some civilians who enjoy it as a form of cardio activity. 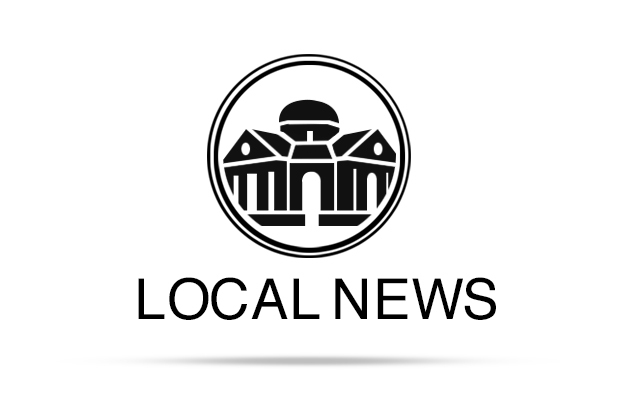 “And learning while keeping moving really works for some people,” Jakel said.